Henry Wallis remains a neglected artist, despite two major works, The Death of Chatterton and The Stonebreaker, that have retained their place in the Pre-Raphaelite canon from the time they were first painted. Little evidence regarding his life survives especially from his early Pre-Raphaelite period. In addition much of his relatively slim output from the late 1850s and early 1860s is lost. However I shall suggest that the titles of his exhibited works offer a strong clue to his radical political and religious beliefs. These make him atypical of the mainstream Pre-Raphaelite movement, given that a central concern of these artists was to present religious subjects in a modern setting, but relates him intellectually to more marginal figures like Madox Brown and the critic William Michael Rossetti who shared his beliefs. Wallis would seem to have been both a Republican and an atheist, views which were usually linked together in the nineteenth century, and which it would have been dangerous to have advertised too openly.1 In 1841 the publisher Moxon was accused of blasphemy for publishing the atheist sections of Shelley’s Queen Mab. The Treason Felony Act of 1848 made the expression of Republican beliefs a felony. Both beliefs in this period would have been associated with the French Revolution and France was still seen as potentially Britain’s major antagonist. Wallis’s choice of subjects until the mid 1850s appears remarkably conventional, some four works on Shakespeare and another taking a subject from the life of Dr Johnson. However his Royal Academy exhibits take a more radical turn in 1856 with the two works he exhibited together with Chatterton: Henry Marten’s tower, Chepstow Castle and Andrew Marvell returning the bribe. During the English Civil Wars Henry Marten had been not only a regicide but also an extreme Republican who was associated with the Levellers. After the Restoration he was imprisoned at Chepstow. In the mid-nineteenth century when Marvell’s present reputation as a lyric poet was only starting to develop he would have been chiefly known by his reputation for political integrity and his association with The Good Old Cause of the Interregnum (he had been Cromwell’s Latin secretary). Although interest in Marlowe's work had been revived by writers of the Romanic Period like Hazlitt and lamb, in the Victorian era he still had nothing like the literary status he was to achieve in the following century. Thus the first production of Dr Faustus since the seventeenth century did not take place until. 1894. A reputation as a dangerous atheist who had died an early and violent death in a tavern brawl still attached to his name. ‘Our elder Shelley’ as Swinburne described him. Wallis exhibited three pictures relating to Walter Raleigh in this period: Sir Walter Raleigh in the Tower circa ad 1600 (1858), Godomore witnessing the execution of Walter Raleigh (1860) and Sir Walter Raleigh (1862). Unlike Millais’s Boyhood of Raleigh these do not purvey the romantic view of Raleigh as a great explorer and the father of British imperialism. Instead, they seem to have focused on his trial for sedition and subsequent execution. In the interregnum, as Christopher Hill pointed out, Raleigh came to be seen as having had Republican sympathies. In addition, like Marlowe, Raleigh had been suspected of atheism in the Elizabethan period. Godomar, in contrast, was a Spanish Jesuit suspected to have instigated James 1 to have Raleigh executed. So the picture might be read as showing the persecution of a radical free thinker by a religious fanatic in league with an absolutist monarch. Seen in this context The Death of Chatterton has a radical political edge. Could Chatterton stand not only for blighted youthful promise but for radical poets like Shelley and Marlowe who also died young? While there is no overt anti-religious message in the picture, suicide was considered a sinful act in Victorian England, and the subject matter of the painting attracted some unfavorable comment at the time. Chatterton’s suicide is not prettified, unlike that of Millais’s Ophelia, nor, as with Ophelia, can his act be attributed to madness. It is the act of a rational being albeit made in desperate circumstances. Robin Hamlyn argues that in the picture Wallis has included the view of the skyline showing St Paul’s for dramatic effect (144). But could it also have been intended as an oblique and hostile reference to conventional established religion and its indifference to the poet’s plight? Certainly his apparent switch to radical subjects in 1856 may have to do with the fact that it was in that year he met Mary Ellen Meredith, the wife of the novelist George Meredith who modeled for Chatterton, with whom he was to have a scandalous affair. She was the daughter of the novelist Thomas Love Peacock, who had been a close friend of Shelley in his youth and with whom Wallis was on good terms. William Michael Rossetti, a keen collector of Shelley relics, recalls Wallis giving him a lock of Shelley’s hair which had originally come from Peacock (I, 158). Mary Ellen herself emerges from Diana Johnson’s biography as a well educated and highly intelligent woman with marked radical sympathies who had been in correspondence with Shelley’s widow Mary Shelley. 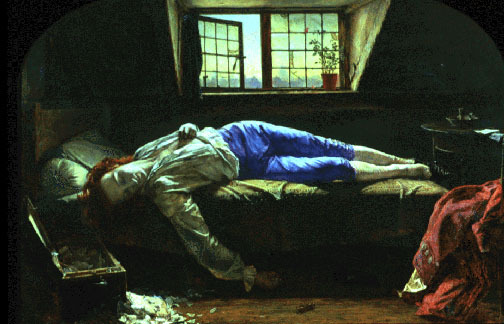 The Shelley connection in Wallis’s background supports a hypothesis that the figure in Chatterton may partly have been intended to represent him. It may be significant that the Marlowe quotation accompanying the picture contains the line ‘And burned is Apollo’s laurel bough’. After being washed ashore Shelley’s body had been burned on the beach in a pagan (sic) ceremony organized by his friend Trelawney. In 1854 the sculptor Henry Weekes had created a marble monument to Shelley showing his drowned body cradled in the arms of Mary Shelley. This was modeled on Michelangelo’s Pieta showing Mary cradling the body of the dead Christ. Arguably Chatterton’s sprawled, lifeless body has much of the feeling of the Christian pieta and may have been indeed intended as a secular version of this with Shelley in mind. Finally, this may provide a context for Wallis’s most overtly social work, The Stonebreaker, which depicts a laborer who has died from incessant toil. Wallis appended to the painting a quotation from Carlyle’s Sartor Resartus on the suffering of the working man. This is sometimes seen as simply a reflection of a wider late 1850s interest in the Social Question but might also be directly related to Wallis’s own radical political beliefs, which link him more to a contemporary French Realist like Gustave Courbet, who also painted a version of the subject The Stonebreakers (1849-50), than to the PRB. 1. Wallis's beliefs are made clear in a letter to him from William Holman dated March 9, 1892 (Oxford Bodleian library, MS Eng c 7039, fols 57-59). Hunt, who had become a devout if idiosyncratic Christian believer since his conversion in the 1850s, responds to to Wallis, who appears to have both disbelieved in a Divine Providence and wanted the British Empire dismantled. Interestingly, Hunt, who had been raised as a nonbeliever, was an atheist in the beginning years of the Brotherhood, and in pictures like Rienzi and The Awakening Conscience displayed a consistent anti-aristocratic and anti-establishment bias — something also made clear in his 1858 pamphlet that attacked Protestant missionaries in Jerusalem — Jerusalem. Bishop Gobat in re Hanna Hadoub — and that was responsible for the fact that Victorian England's most famous painter of religious subjects never received a church commission. The Death of Chatterton — a Promethean Picture? Dabbs, Thomas. Reforming Marlowe: The Nineteenth century canonisation of a Renaissance dramatist. Bucknell: Bucknell University Press, 1991. Hamlyn, Robin. Chatterton, Leslie Parris (ed) The Pre-Raphaelites. London: Tate, 1984. Holmes, Richard. "Death and Destiny." the Guardian (Jan 24 2004). Johnson, Diane. The True History of the First Mrs Meredith and other Lesser Lives. London , Heinemann, 1973. Lawson-Peebles, Robert, The Many Faces of Sir Walter Raleigh, History Today48.3 (1998). Rossetti, William Michael, Some Reminiscences. New York: Scribners, 1906.